I've started working the edging on the Cherry Blossom Shawl which both binds off the shawl, and finishes the edge nicely. If you've never done a knitted on lace edging, I'll explain it. After knitting the main section of the shawl, I have a giant circle of live stitches on the needles. If I were to try to bind them off in the traditional way I would never be able to get it loose enough for the lace to stretch during the blocking and it would look terrible. Fortunately, some long ago lace knitter figured out that if you add a decorative lace edging perpendicular to the live stitches, you can work one stitch of the edging with one of the live stitches from main part of the shawl and fasten off these main stitches without an actual bind off. Attaching lace to lace and live stitches to live stitches allows everything to stretch properly in the all important blocking phase. If you're looking for a design that uses this edging technique to finish off a shawl, in addition to the Cherry Blossom Shawl, my own designs Leda's Dream, Scheherazade, Moon Dance, and Atlantis all use this technique. There are other designs that use this technique as well, of course, but this will give you a sample. At this point, I'm about 1/4 of the way around the shawl (assuming I'm doing the math right) and I'm estimating that I have about 6 hours, give or take to finish the edging up. The edging stitch pattern is easy to memorize and is working pretty quickly. 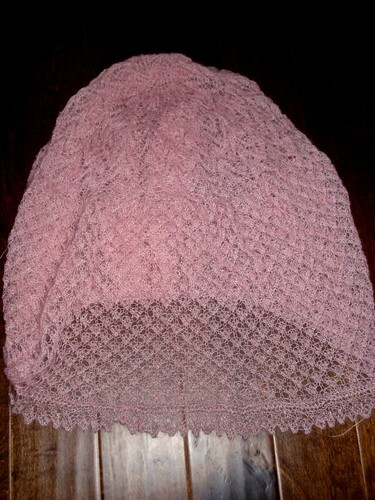 The more I do on the edging, the less it looks like a Fluffy Pink Squid of Doom!